The 1st Battalion at Malta had a successful sporting season, particularly at football and hockey, finding nine members for the Army for both football and hockey teams. The Battalion football team won the Cassan Cup, the United Services Cup, the Daily Malta Chronicle Cup, Command Senior League Cup and the Soldiers Cricket Cup. In the final of the Army Cup they lost 3 - 1 to the 24th Field Company, Royal Engineers. There were some successes at athletics but nothing of mention in shooting and on October 8th the Battalion embarked for China. 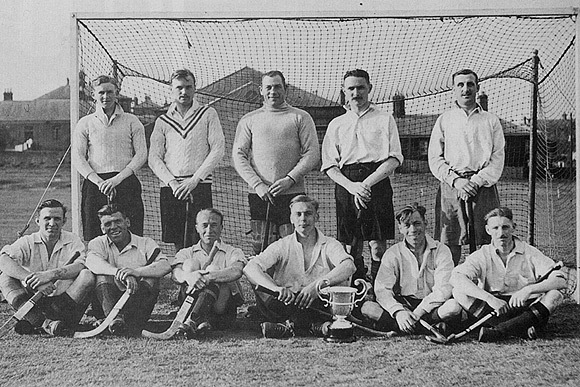 At Dover the 2nd Battalion were runners up for the Army Cup for hockey, a distinction never reached before by either Battalion. In the Eastern Command Fencing Competition Lt L.C. East came first in Epee and Sabre while Lt D.L.A Gibbs came second in Epee. Both won particular mention for their fencing abilities. 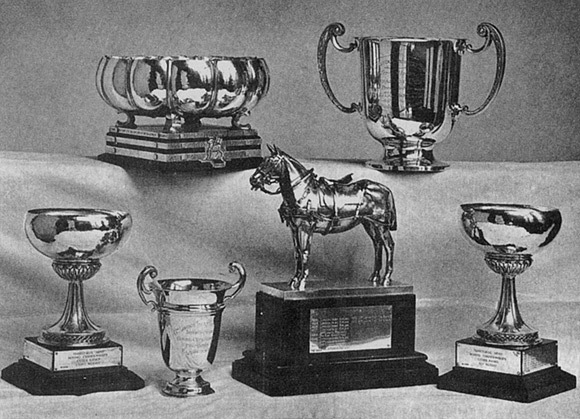 There was some cross country running and also a Hunt meeting at which Lt Block finished second in the HeavyWeight race on his charger Bronco. 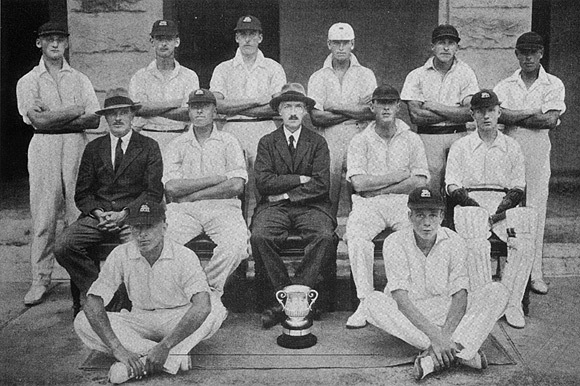 The 4th Battalion reached the Divisional Final of the TA Cup but lost to the 9th Middlesex. They took first place in the 44th Home Counties Divisional Championship Cross Country Match. At boxing L/Cpl Stovold 5th Battalion obtained runner up position in the Welter-Weight Division, while at shooting C Company gained 3rd place out of 451 teams entered in the SMRC Territorial Army Company Team Small Bore Rifle Match. 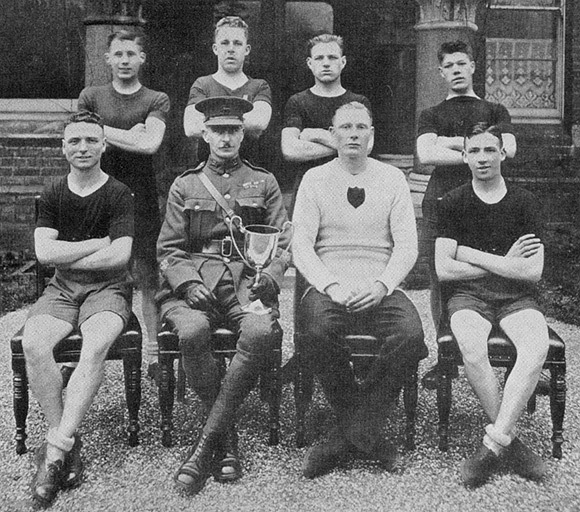 The Cadet Corps of the Royal Grammar School, Guildford had continued success in shooting. The Country Life Class "B" Cup was retained with a record score of 1 009. Other trophies secured were the Surrey Advertiser Cup, the Boys of Surrey Challenge Shield and the Tudor Challenge Shield (Bisley). Standing: Sgt Rigby, Sgt Martin, L/Cpl Parsons. Seated: RQMS Routley, CSM Smith, Capt W H Alleyne, C/Sgt Pascoe. Firmly established in China in 1931 the 1st Battalion soon made their sporting presence known. In athletics 2/Lt Sydenham-Clarke gained first place in four Inter-National events in long distance running. He also won the 1500 metres (International) at the Tientsin Anglo-Chinese Athletic Meeting, together with other sporting awards that year. The 2nd Battalion at Dover were preparing for a move to Aldershot which seemed to have rather limited sporting activities. Nevertheless Pte Reeves came first in the Dover Hospital Challenge Cup Cross Country Run and Cpl Salmon won the County Shooting Championship with a record score of 173. The 1st Battalion in China in the early part of 1932 had little to report sports wise as they were on split stations between Tientsin, Peking and Shanghai. At Aldershot the 2nd Battalion were also limited although in boxing there was some success. In the Boys Inter Unit League the Queen's Boys defeated the Welsh Guards by 5 bouts to 3 but then lost to the Green Howards 6 - 3. Off to a flying start, the Battalion won the Cross Country Running Group Championship the day after arriving to join the Aldershot Command. 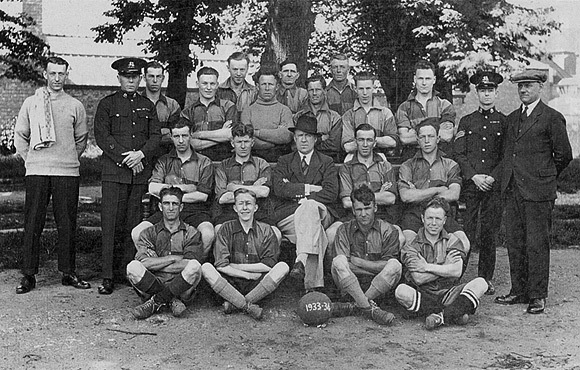 The 2nd Battalion in Aldershot played some sixty football matches in the 1932-33 season but without notable results, there being little time for any inter company matches. At hockey they reached the final in the Aldershot Command Hockey Competition but were defeated by the 1st Bn The Royal Warwickshire Regiment 3 - 1. Sgt Berry obtained his place in the Army Hockey Eleven for the season while Lt G.S. Grimston played regularly for the Command and the Army. Pte Reeves was a distinguished cross country runner who regularly appeared for the Command Harriers and the Army. In the Army Championships at Colchester he came fourth in the Army Inter Unit Fencing Championship. The Battalion defeated The Bedfordshire and Hertfordshire Regiment who were the only other entrant. Lt L.C. East was awarded his Army Fencing Union Colours while Lt D.L.A Gibbs fenced regularly for the Army Union. In the first round of the Army Inter Unit Boxing Competition the Battalion lost to the 1st Bn The Green Howards by 19 points to 25. In the years 1932-33 six members gained Army Colours. Able Seaman T Payne, L/Cpl A j Caldicott. Middle Row LtoR: Cpl G Hooper, Able Seaman H Tugwell, Pte E Cantor, Petty Officer G Daisley, Bdsnm F Moss, Able Seaman H Nicholas, Sgt F Hill, Able Seaman S Wardley. Front Row seated LtoR: Able Seamall G Cheetham, Pte T Richardson, Lieut FT Boswell RN, L/Cpl C Woodards, Officer Steward A Woodford, Pte W Barclay. D/M L Lockwood, Capt D L A Gibbs. In 1934 2/Lt AJ.A Watson, as part of a consecutive six year run of successes (1932-37) in Army Competitions, achieved a throw of 44 ft 1/1 in Putting the Weight. Again in the same six years he was an athletic representative of the Army against the Royal Navy and Royal Air Force. In 1934,35,36 and 37 he represented the Army in Inter-Service Rugby Matches - a truly versatile sportsman if ever there was one. Sport in the 1st Bn the Queen's suffered a disastrous set-back in 1935 due to the Quetta Earthquake when members distinguished themselves in far more serious activity. At the Individual Athletics Meeting Pte Fuff was the winner with 38 points while Pte Barker came 3rd . Understandably there was nothing further of note to report. 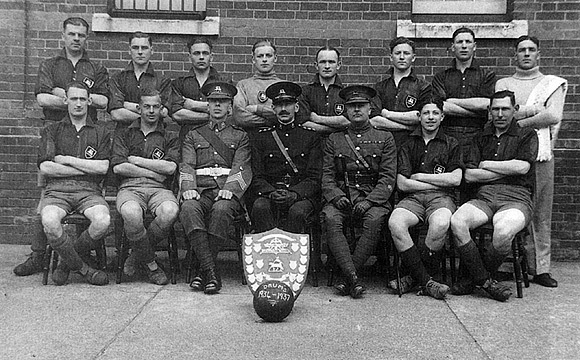 The effects of the earthquake were still being felt by the Battalion in 1936 but a start was made in raising a rugby football team. Individual talent obviously existed as during the 1935-36 season thirteen Rugby Colours had been gained. At the Battalion Rifle Meeting Sgt Dennis was the Battalion Champion and was congratulated on his consistently high standard in all matches. On the Isle of Wight the 2nd Battalion's Capt Grimston and Sgts Berry and Collins were awarded the Aldershot Command Colours for Hockey for the previous season. LtoR Back Row: Pte Hill, Cpl Gilbert, Bdmn Knight, L/Cpl Gear, Sgt Dixon. Middle Row: Lt R E Pickering, Capt R H Philpot MC., Capt G K Oliver MC., 2/Lt G S Grimston, 2/Lt Sant Singh. Seated: L/Cpl Collins, Dmr Wells. The Depot had a reasonably good season at football. Of 21 matches played, 11 were won, 8 were lost and 2 were drawn. Goals for were 96, against 69. More success was achieved by the 4th Battalion who reached the Divisional Final of the Territorial Army Football Competition. In boxing Pte Parr fought his way into the Divisional Finals. The 5th Battalion were successful in the Brigade Boxing Cup where they came 1st and in 44 (He) Divisional Boxing Finals where they came 2nd. 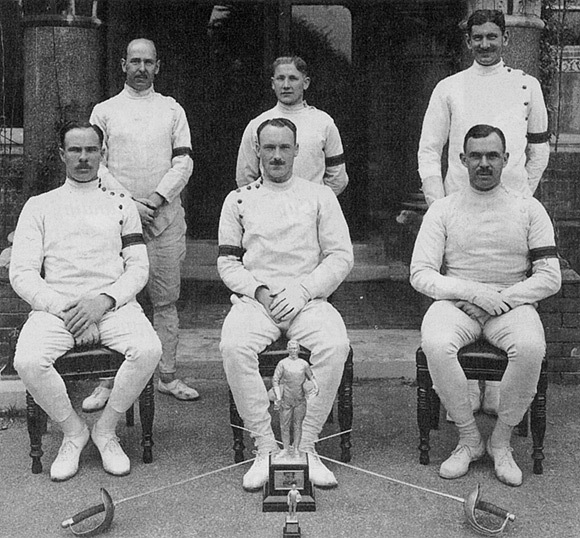 Fencing Team Olympia 1930. Winners Army Inter Unit Fencing Championship. Standing: Capt R H Philpot, L/Cpl F Hope, Lt D L A Gibbs. 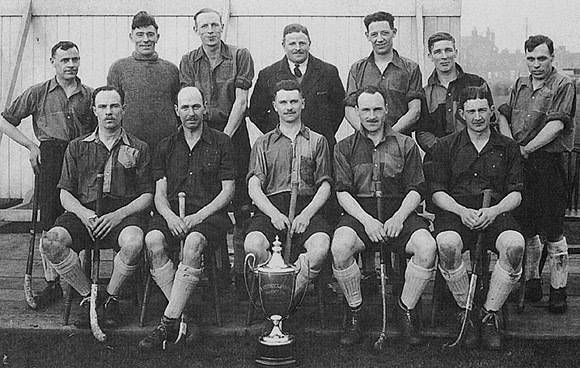 Winners Eastern Command Hockey Cup 1931 and Semi Finalists Army Hockey Cup. Back Row: Sgt Swanick, L/Cpl Wines, L/Cpl Knight, Lt J Y Whitfield, Sgt Berry, Sgt Hooper, Cpl Collins. Seated: Lt L C East, Capt R H Philpot, Lt HE Wilson, Lt F J Davis, Lt G S Grimston. Berry, Grimston & Collills were also Aldershot Command half back line. 1938 saw the Depot doing well at shooting when they won both the Belhaven and Watney Cups at the County Rifle Association Match at Bisley. The 2nd Battalion were having a successful season at football, winning the first round of the Army Cup by defeating the Royal Tank Corps 6 - 1, they fell victims to The Middlesex Regiment 3 - 2 in the second. In the Boys Army Cup the Queen's Boys reached the semi-finals before being beaten by the Cameron Highlanders 2 - O. A happy position of 2nd from the top of Division 1 in the Portsmouth and District United Services League was reached. L to R Standing: 2/Lt J D Sparkes, Lt J Sykes-Wright, Cpl J Stannard, Capt B E L Burton, Cpl J Potter. 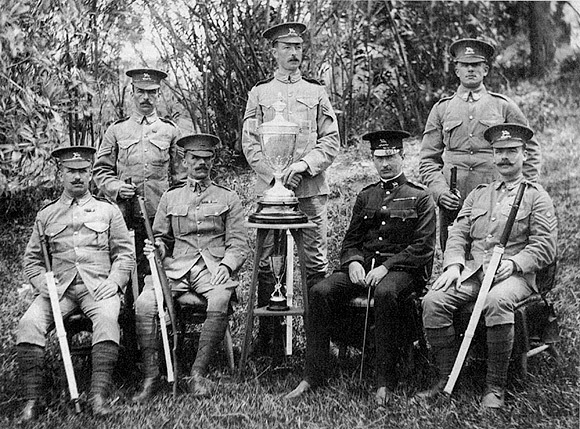 Seated: Cpl J Bunn, Cpl V Brown, Pte S Hammond, Cpl A V Domoney, L/Cpl R Potts, L/Cpl T Fairs. Some successes were gained at hockey, victories being obtained over the 2nd Bn The Middlesex Regiment and the RAOC in the 1st and 2nd rounds of the Army Cup but defeat 2 -1 following in the 3rd against the Armoured Fighting Vehicles School at Bovington. 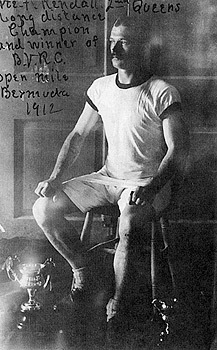 Boxing was reported to be "going strong" allegedly helped by the influx of some rejoined reservists. In the Battalion Championships Cpl Edwards and Cpl Stannard fought each other with victory going to the former. The Queen's were runners up to the 2nd Bn The Lincolnshire Regiment in the Girdwood Cup Inter Unit Brigade Competition. The Depot had a good recruits team at football. They played representative sides from four other depots and only lost one game. The hockey team also did well, winning 20 out of 22 fixtures played with 110 goals scored against opponents' 26. The Depot Queen's, Recruits Boxing Team Winners, Eastern Command Recruits Championship 1931. Back Row: Pte G Barnes, Pte B Noke, Pte E Bamshaw, Pte E Garner. The Price Signalling Cup, TA Boxing Championships Lt Weight, 142nd (6th London Bde Boxing Challenge Cup, 47th Div Transport Trophy, TA Boxing Championship (Flyweight). Territorial Army Welter-weight and Imperial Services Boxing Association Champion, 1938. He served throughtout the Second World War firstly as a Sergeant in 1/5th Queen's and then transferred to the APTC as a Sergeant Instructor. Boxing seems to have been the main attraction for the 5th Battalion who scored notable successes in Territorial Army Championships. 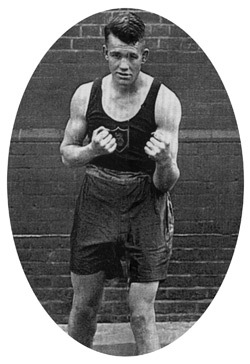 Pte Shackleton became the Territorial Army Welter-Weight Champion for 1938 and later became the LS.B.A. Champion. Equally good at boxing were the 6th Battalion who won the 131 Brigade Boxing Championships. In the later part of the year the 1st Queens in India found that Rugby Football seemed to be suffering due to Association Football proving a counter attraction, but in the Inter Unit Games a victory was scored over 12/25 Field Regiment RA. At football the Administrative Platoon won the Inter Platoon (Hot Weather) Football Competition, playing and winning 11 games with 42 goals scored for and 1 against. At hockey three games were played against the Allahabad Police with the Queen's winning all of them. At cricket the Transport section linked with the Pioneer Section reached the final where they were defeated by 30 runs by the Administrative Platoon. Shooting was obviously still considered an important activity as in the Orton Cup, a Pistol Match for Units of the Allahabad Brigade Area, the Regimental Team beat the Cawnpore Contingent A.F.L by a margin of seven points. 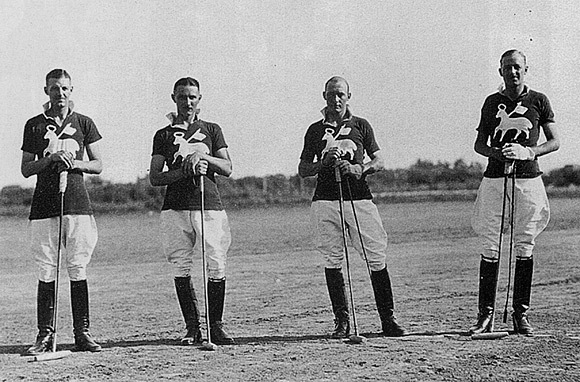 Bn Polo Team, Tientsin 1933. On Home Service the Officers Team of the 2nd Battalion won the Spicer Cup in the Portsmouth United Services Rifle Meeting. A Lewis Gun Competition, the Connaught Challenge Cup, was won by L/Cpls Cronk and Church with Ptes Conlan and McKay. The Depot scored a success at the Surrey Rifle Meeting when they defeated a Depot Team from the East Surreys in the Belhaven Cup by 40 points. In the closing months of 1938 sporting activities were naturally seriously curtailed by the advent of the Munich crisis and the gathering clouds of war. 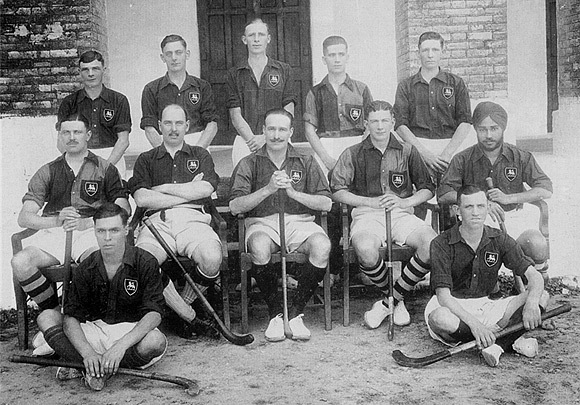 The 1st Battalion, still at Allahabad in 1939, reported a lack of hockey activity, but things were better in the football sphere where in the Murray Cup Final the team defeated The Royal Berkshire Regiment 2 - O. In the Lucknow District Football Tournament the team repeated and improved their performance by defeating the Royal Berkshires 3 - O. Shooting was still being zealously pursued. At the Battalion Rifle Meeting Lt (QM) Watford was winner with 2/Lt N.A.H. Marsden. In the 1st Battalion Pistol Championships Lt (QM) Watford, L/Sgt Kettle and PSM Martin were 1st, 2nd and 3rd. 1st Bn Cricket Team. 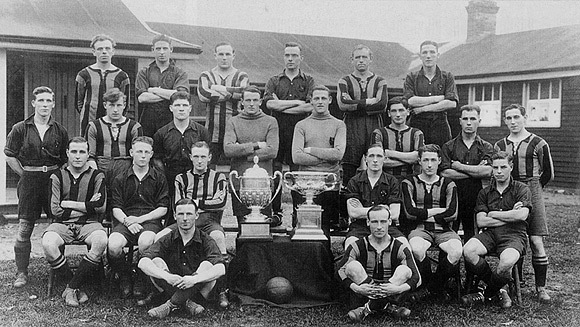 Winners Soldiers Cup, Malta 1930. Standing:- L/Cpls Underdown, Rowbottom, Sharp. Ptes Keen, Miles, Barclay. Seated:- Capt E S Bingham MC., CSM Hartridge, Lt Col H C Ponsonby DSO MC., L/Sgt Caldicutt, Pte Willis. The 2nd Battalion were in Palestine, continuously engaged in "search and destroy" operations so there was no time for sport. At the Depot the hockey team managed to get into the semi-final of the Eastern Command Competition but were then beset by influenza which ended their hopes. At the 131st Infantry Brigade Boxing Championships the 5th Battalion won the 44th Division Territorial Army Boxing Championship. The war then intervened.